If you’re a hardworking man or woman with a physically demanding job, you know how vital good work boots are. Since you spend an equitable amount of time on your feet, a good pair of work boots not only protects your toes but also, protect you from exposed nails, slippery floors, electrical charges and critical temperatures not to mention comfortable boots that give your feet the support and ease you need. While there is no question about the importance of work boots, choosing the right pair of boots can be quite daunting. However, even if you get the best pair of boots in the market they are still prone to wear and tear hence, a little modification to keep those boots in tip-top shape is essential. Since most boots wear out on the toes, a pair of good boot toe protectors might be what your work boots need to get more mileage from them. A boot toe guard is a durable reinforcement wrapped around the toes at the front of your boots to offer protection for your toes and feet and prolong the life of your work boots. A I have done hard yards for you and put together this all-inclusive guide to help you find the best toe protector for both your safety and protection. The first step is to fully understand your job requirements as an employee to ensure safety footwear from the dangers you are exposed to in your work area. Ensure that the toe protector is made from electrical shock-resistant materials designed to provide maximum protection against contact with electrical conductors and live wires. Conductive properties should also be a key feature to protect you from environments prone to static electricity. Puncture resistant boot guards which help protect you from sharp objects that could penetrate the boots sole. The classic steel toe protector is a reinforcement cap that offers superior protection to your toes from falling objects or compression as well as, protecting you from punctures from below your feet. 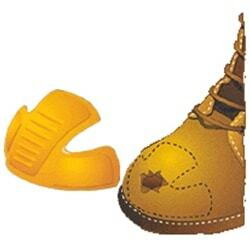 If you can’t find work boots with steel toe guards built in with a toe cap, you can easily find steel toe safety caps designed to meet specific ANSI/ASTM safety requirements that offer more protection resistance for your feet from the great impact of heavy falling objects to modify your work boots. A composite toe cap is an important safety cap reinforcement designed to offer maximum safety protection for your toes and feet while working. Since composite toe guards for toe protection are non-metal and non-magnetic and are lighter than a steel toe cap making them more comfortable when working. Composite toe protectors are highly preferred to most toe protectors in the market today and for a good reason, they meet the meet safety standards and provide notable benefits: they have better electrical resistance compared to most boot toe protectors especially steel guards. 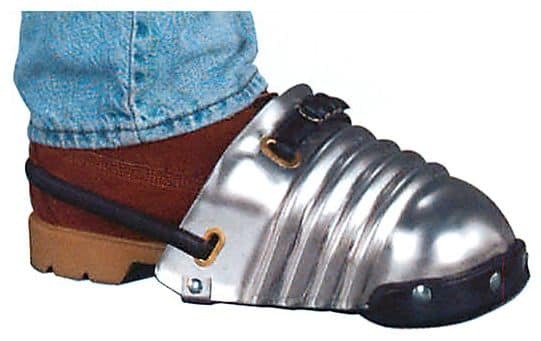 If your job requires you to work regularly around live wire, composite toe boot protectors made of non-metallic materials that do not conduct electricity are the best option. Also, when working outdoors especially in extreme conditions, composite toe boots are highly preferable and ideal. Additionally, the composite toes protectors are lighter than steel making them easier to lift and give you more comfort especially when you are wearing them for a long period of time. The metatarsal boot guard is designed to cover the front of the foot, and greatly aids prevent the intensity of the impact of a falling object or compression to your foot where the metatarsal bones are located and toes. This toe protector takes protection to the next level offering extra protection, not excluding the everyday comfort you need. 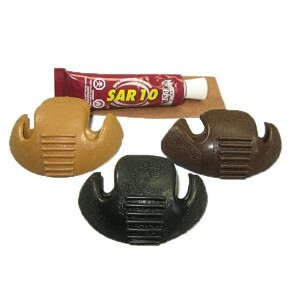 Advance boot toe protectors can be found in a variety of brands available in the market today. 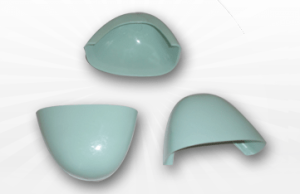 The significant benefits of boot toe protectors are known to a wide range of end-users for their beneficial features. Therefore, just before you throw out your old pair of boots, consider buying a quality boot toe guard to make your boots last even longer.